With 79 grandiose one bedroom pool villas and expansive residences unravelling over two, three and four bedrooms, the best underwater restaurant on earth and a 3:1 staff-guest ratio, Anantara Kihavah Villas in the Baa Atoll UNESCO World Biosphere Reserve is one of the Maldives most resplendent resorts. For the ultimate adventures above and below the water, guests staying here go from their luxurious Overwater Pool Villa with glass-bottomed bathtubs to an underwater restaurant, aptly named SEA, for award-winning gourmet dining and degustation dinners. 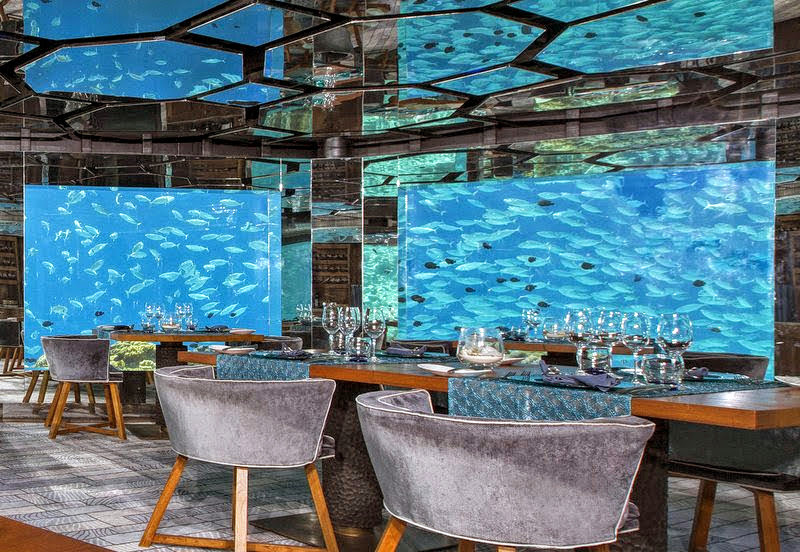 The mirrored interior reflects the surrounding Indian Ocean marine life as you dine on European cuisine and indulge in paired wine suggestions from the resident Wine Guru. 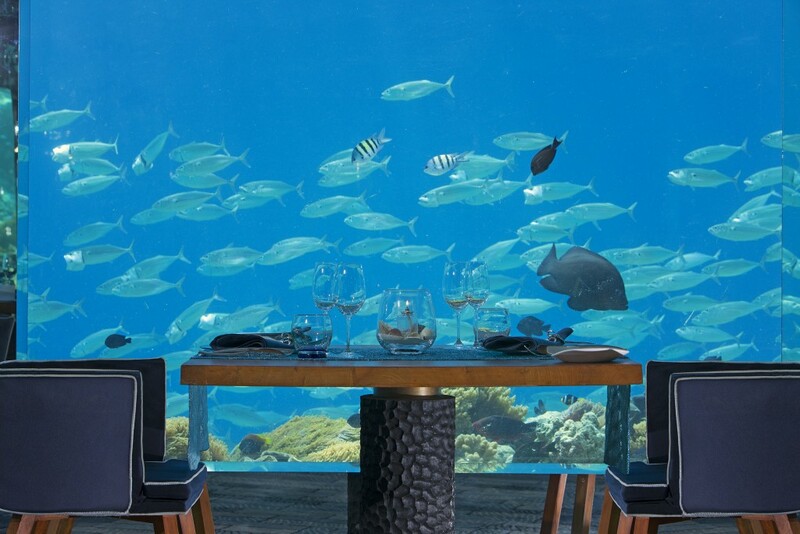 Voted by World Travel Awards 2015 as the World’s Best Underwater Hotel Restaurant, SEA doubles as a restaurant and the world’s only underwater wine cellar, with coveted 360 labels in its collection. SEA serves lunch and dinner, as well as breakfast on request, while taking in the 360-degree view of the Indian Ocean’s mesmerizing marine life around you. Four-course degustation menus are served under the winning combination of Senior Wine Guru Nilesh Bootun’s expertise of varietals and vines, and the culinary ‘Haute & Nouvelle Cuisine’ experience of the resort’s new Executive Chef, Lamberto Valdez. Where else can you tour the vineyards of the world six metres underwater? 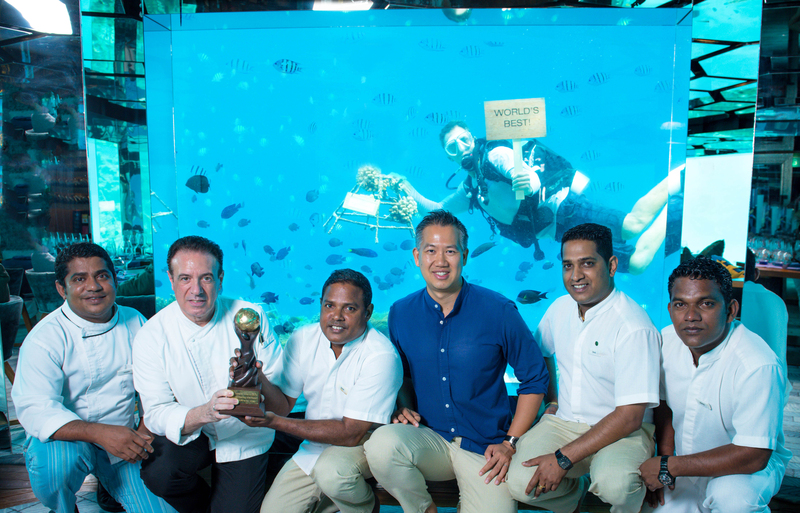 For the second consecutive year, Anantara Kihavah Villa’s acclaimed underwater restaurant SEA received the prestigious three star accolade from World of Fine Wines Magazine. In the publication’s World’s Best Wine Lists, over 4,000 restaurants from around the globe were considered for the awards, with just 896 restaurants bestowed a one, two, or three-star accolade, and only 300 wine lists making it into the top three-star category. The wine awards have quickly become some of the most prestigious awards within the restaurant community. According to World Sommelier Champion Gerard Basset, the awards are the pinnacle for a restaurant wine list: “These exciting new global awards are rapidly becoming as coveted as Michelin Stars.” The esteemed panel of senior judges this year included some of the world’s greatest experts, including Alder Yarrow, Elin McCoy, Ch’ng Poh Tiong, Andrew Jefford, Andreas Larsson, Francis Percival, Tom Stevenson and The World of Fine Wine Editor Neil Beckett. Also voted by World Travel Awards 2015 as the Leaving Villa Resort in the Maldives, poised over a lagoon with sweeping ocean views are 40 Overwater Pool Villas, arranged in a grand circular formation and interlinked by an overwater bicycle pathway. A tall arched doorway reveals vaulted ceilings and dark hardwood floors, leading to the main bedroom where each villas opens up onto a wraparound deck, and it’s there that Anantara Kihavah Villas epitomises Maldivian luxury. Furnished with a queen-size daybed that swings from the ceiling, hammocks that hang over the lagoon and a ladder that drops you straight into the water, this is where your dreams take a holiday. The piece de resistance, however, is found in the bathroom. Fronted by floor-to-ceiling sliding glass doors with step-through access to an oversized plunge pool, it features a glass shower with intricately engraved doors and sweeping Indian Ocean views, an outdoor rainforest shower, his and hers vanities, a cream chaise lounge and a glass-bottomed bathtub that peers down into the sparkling turquoise waters; a quick glance down and you can see tropical fish, a turtle, or even a spotted eagle-rays sweep along the bottom of your tub.